He went on to say that he remains “ready” to shut down the border if necessary but expressed satisfaction with what he said are ramped up efforts by Mexico in the last couple of days to more aggressively stop migrants making the journey north to the U.S.
“I could do it in 45 minutes, we need to get rid of chain migration, we need to get rid of catch and release, and visa lottery, we have to do something about asylum. And to be honest with you, we have to get rid of judges,” Trump said. “It’s the worst, dumbest, immigration system in the world, the Democrats could change it with one meeting, everyone would agree, but they don’t want to change it because they don’t want to give Republicans a victory,” Trump said. As Trump spoke, Senate Republicans were warning him it's a very bad idea. "Closing down the border would have potentially catastrophic economic impact on our country and I would hope that we would not be doing that sort of thing," Senate Majority Leader Mitch McConnell told reporters. “I don't think it's a good idea and I think the president is speaking out of frustration,” GOP Sen. John Kennedy of Louisiana said. GOP Sen. Chuck Grassley told ABC News that he's concerned about the ramifications on American businesses should the U.S. cease trading with Mexico if the border is closed. 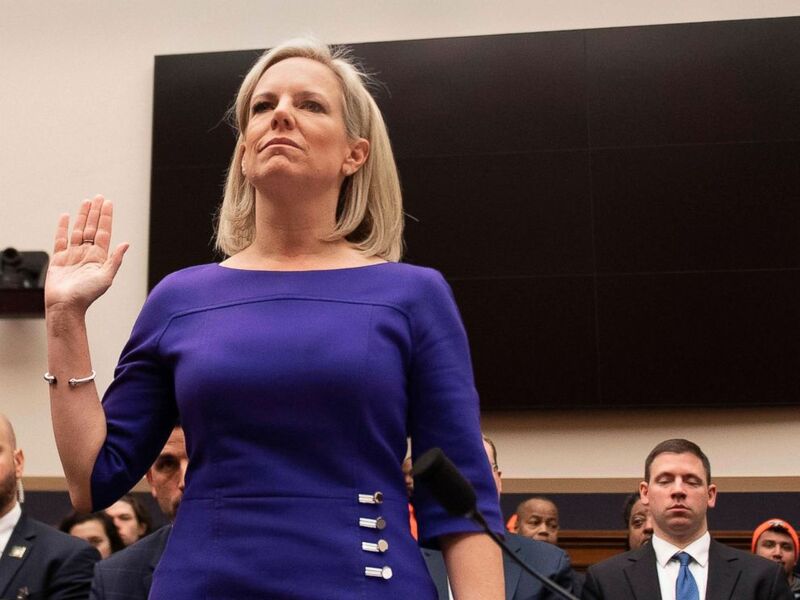 Secretary of Homeland Security Kirstjen Nielsen is sworn in ahead of her testimony to the Judiciary Committee on "Homeland Security Oversight" in Washington, D.C., Dec. 20, 2018. As President Trump threatened to close the U.S. border with Mexico, Homeland Security Secretary Kirstjen Nielsen cut an overseas trip short to oversee decisions on the border response, returning to Washington, D.C., a senior DHS official told ABC News on Tuesday. Nielsen had left for the trip early Sunday and arrived back in Washington early Tuesday morning, the official said. The secretary was scheduled to be in Europe all week for bilateral security meetings, representing the U.S. at gathering of G7 interior ministers. Nielsen is expected to head to the southern border on Wednesday, the official said. The president is scheduled to make his own trip to the border in Calexico, California, on Friday, near where the administration says a section of border barrier has been upgraded. Despite the extremely short trip, a source says Nielsen “had sensitive discussions on counterterrorism and cyber issues” while in the UK. “But as Washington was asleep, Secretary Nielsen made some decisions on border response and decided she needed to oversee those personally. So we asked our Deputy to tap in and take over the trip,” the official said. The president last threatened to shut down the border during the heat of the midterm elections and threatened the same action last spring, though he didn't follow through in either instance. Speaking with reporters Tuesday, White House press secretary Sarah Sanders appeared to walk back the president's threat to shut down the border as soon as this week by saying that the president isn't working under a specific timeline. “The president's not working on a specific timeline, he's working to look at all of the options on the table," Sanders said. "We're hoping that Mexico will continue to step up like we've seen them do over the last couple of weeks, we hope that that continues and that we can work with them so that we don't have to do that." As did Trump, she said Mexico is already taking steps to address the president's concern that it isn't doing enough to stop the flow of Central American migrants as they journey north to the United States. "They have started to do a significant amount more, we've seen them take a larger number of individuals and hold in Mexico that have asylum claims while they wait to be processed in the United States. We've also seen them stop more people from coming across the border so that they aren't even entering into the United States," Sanders said. Sanders said the administration is preparing for the prospect of shutting down the U.S. ports of entry from Mexico and that the Council of Economic Advisers is conducting studies into the economic repercussions and how to mitigate the effects on consumers. “Certainly we're looking at all options when it comes to the different ports of entry, what that looks like and what the impacts would be. CEA is doing a number of studies on this and working with the president to give him those updates,” Sanders said. Though Democrats have called Trump out for bluffing -- House Majority Leader Nancy Pelosi on Tuesday called it a "notion" that "can't possible rise to the level of an idea" -- Trump has said he isn't "playing games." The president's acting chief of staff, Mick Mulvaney, has said it would take "something dramatic" for the president not to follow through on the shutdown threat. U.S. border authorities last week announced that the number of undocumented migrants stopped at the southern border could reach as high as 1 million by the end of the year -- potentially twice as many as last year's level and a 140 percent increase over his first year in office. Nielsen called the situation a "real-life humanitarian and security catastrophe" with numbers trending from "bad to worse." While shutting down U.S. border crossings would not stop the vast majority of unauthorized arrivals, who mostly cross illegally between border stations, it would halt the flow of trade between the U.S. and Mexico, which totaled $611 billion in 2018, or $1.67 billion per day. More than 40 percent of all fruits and vegetables brought into the U.S. come from Mexico, for example, according to data from the Department of Agriculture. In 2016, Mexico produced 91 percent of all avocados consumed in the U.S. Tomatoes are also at the top of the list. The dramatic impact of closing just one port was proven in November, when a port in San Diego was ordered closed for six hours to prevent a large group of migrants attempting to cross from Tijuana. The closure cost $5.3 million in lost revenues, according to the U.S. Chamber of Commerce. Over the weekend, Trump also said he stopped the flow of aid to Guatemala, Honduras and El Salvador because they weren't doing enough to stop the pattern of migration. For years, the United States has worked with these countries to address the the problems there that cause migrants to leave in the first place, like an unstable economy, violence and political corruption. ABC News' Quinn Owen and Cheyenne Haslett contributed to this report.